There is a reason that the Annapolis, Maryland, law firm of McNamee, Hosea, Jernigan, Kim, Greenan & Lynch, P.A., is known as the "business owner’s law firm." We have been representing clients throughout Maryland and in Alexandria, Virginia, for more than 30 years. Whether we are addressing a client’s current concern or helping with plans for the future, our attorneys make it a point to keep the client’s best interests in focus. Our law firm is home to more than 25 attorneys who take the time to get to know a client, and his or her company. This enables us to put together the best possible legal strategy for matters including business formation, drafting and reviewing contracts, or planning a defense for an insurance company. We have access to outside experts and cutting edge legal tools that ensure our representation is thorough. The main focus at our law firm is to put the client first. 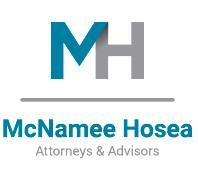 People who work with McNamee, Hosea, Jernigan, Kim, Greenan & Lynch, P.A., know that we prioritize communication, whether that means responding to questions promptly or keeping a client apprised of how the case is progressing. Our clients can expect aggressive representation that targets their goals and protects their bottom line.